Do you have a child in Reception or Years 1 and 2 at one of our partner schools? 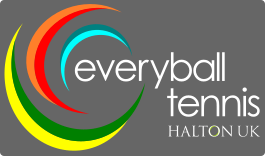 If they haven't visited us yet, we'd like to invite them to try a session free of charge here at Halton Tennis Club. Sessions run every week day from 4-5pm -- perfect for after school -- as well as Saturday mornings from 9-10am. If your child enjoys their session, we'd like to offer you 15% off the remainder of the course until the end of the term. We can get any older siblings -- and even adults -- playing too! We'll be playing on the indoor courts and there's no need to bring anything at all with you as we'll provide all the equipment. To let us know you'll be joining us for any of these sessions, please email james@everyball.net or call 07981 152 818 so we can get a sense of how many new young players we can expect. Last month, we shared the exciting news that Halton UK has been selected by the Lawn Tennis Association to become a Local Player Development Centre -- bringing on and supporting future generations of great British players. We do hope you'll join in our LPDC celebrations. We'd love to have the chance to show you round the Halton Tennis Centre so you can see all the great learning -- and fun! -- that goes on here.